The dates for my next three conference trips are set. If anone lives there and wants to be visited, just let me know. I will be in Dortmund in December (2-4) - if anyone lives there and wants to be visited, just tell me. I completely forgot about this thread... not that anyone has ever used it, but still I want to keep it alive - who knows, maybe one day one of us happens to travel to a place where someone else is just waiting to be visited (or reads about a meeting of others and decides to come as well). i do it most time during our holidays :-) But those ppl are not here anymore i ve seen. you cant read this forum on a pad or phone so that could also be a reason for some. So I went to Tarifa last weekend with my sisters Anne and Aylin and their friend Denise, visiting Bianca, Impie, Evita and Unico. 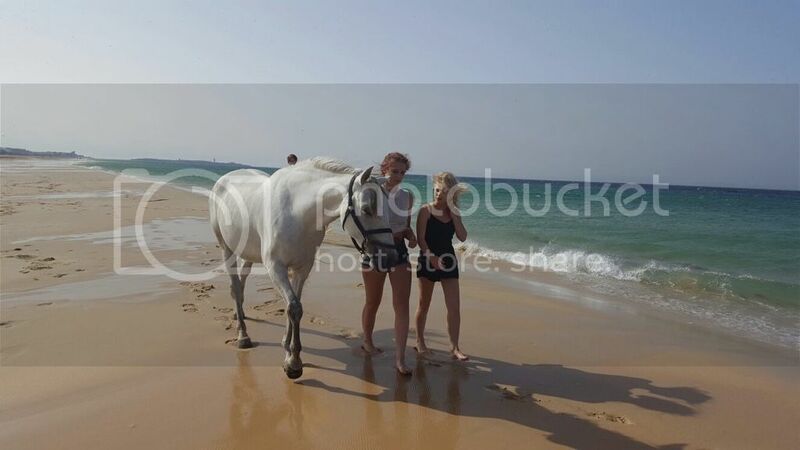 Here are some pictures of the girls and Impie at the beach. That looks wonderful! Nice to see Impie again!